Between driving to work, running errands, and family road trips we spend a lot of time in our vehicles. Don’t let your car turn into a dumping ground. 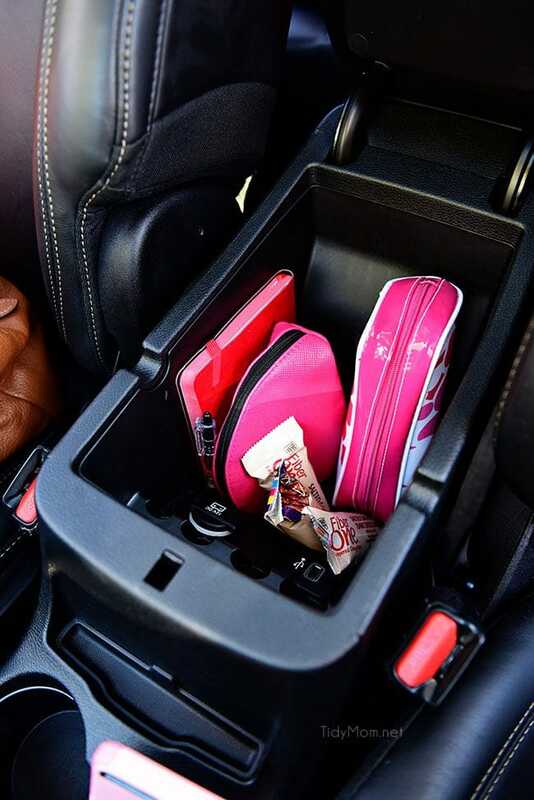 Keep it tidy with these clever ideas and tips for car organization. Just wanted you to know that this post is sponsored by my friends over at Fiber One. I’ve always been one to keep my car clutter free as possible. Organizing your car, like your home, will not only save time but also promote less potential stress. 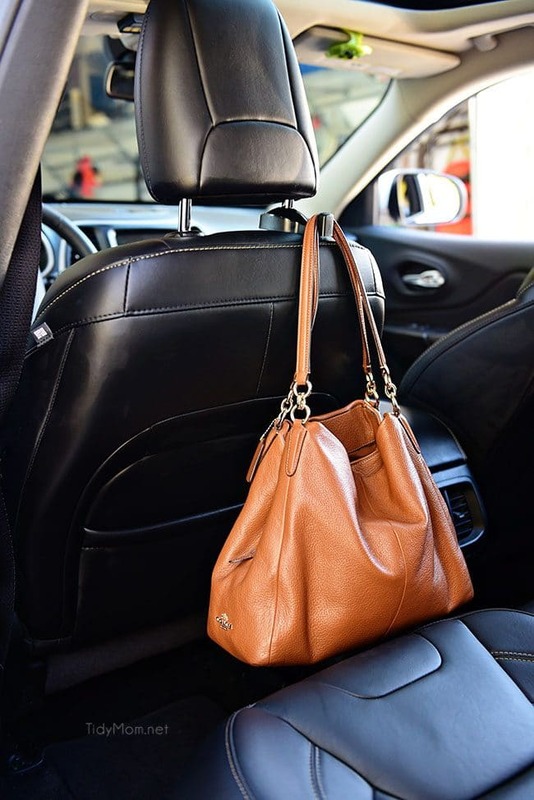 Today I’d like to share a few tried-and-true things that work for me, to keep my car organized. The first order of business was to organize the back of my car. 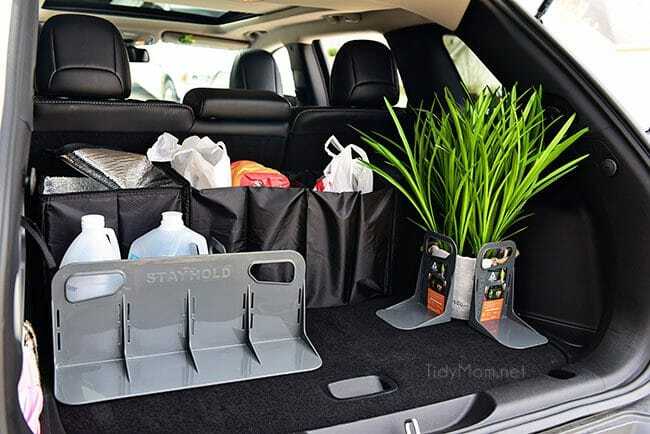 I wanted to find some kind of car organization tools that would keep my groceries and and anything else I might be hauling from rolling all over the back of the car. 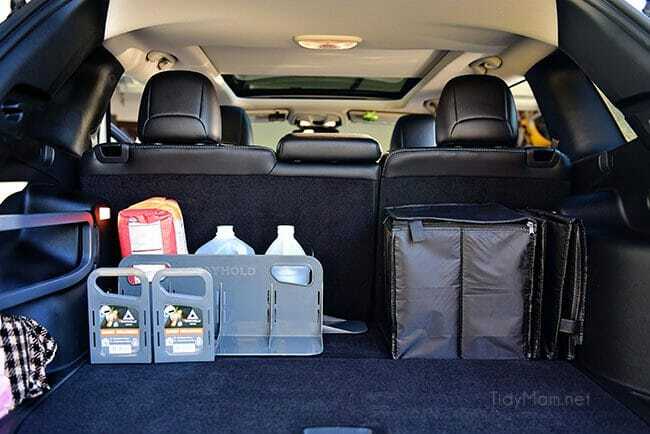 Cargo organizers are essential for car organization. 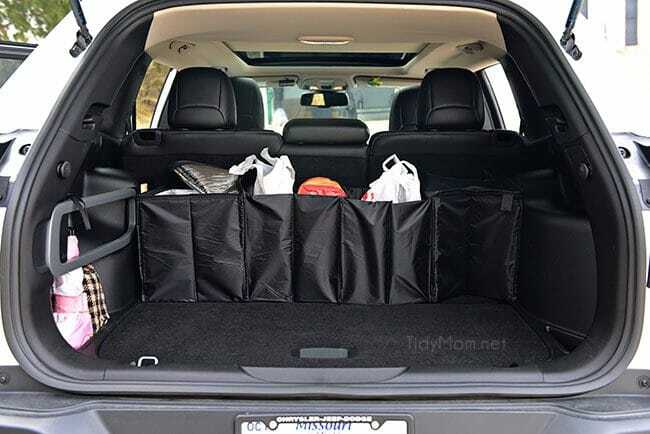 Whether you need something to contain what you are hauling or the corral items that you keep in the car, I think you’ll find both of these organizers a big help for car organization. 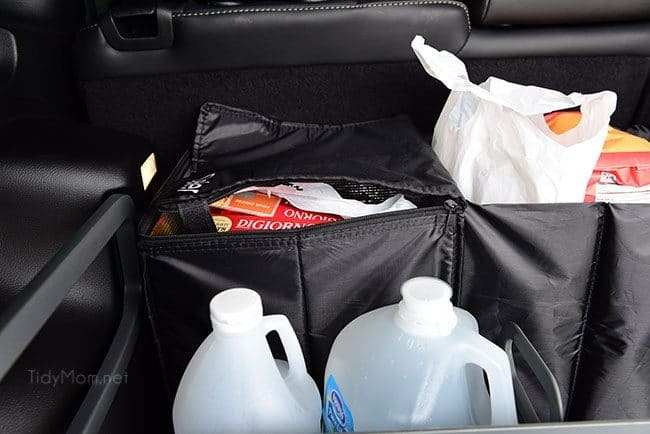 This foldable 4-compartment trunk organizer was the perfect find for my groceries. 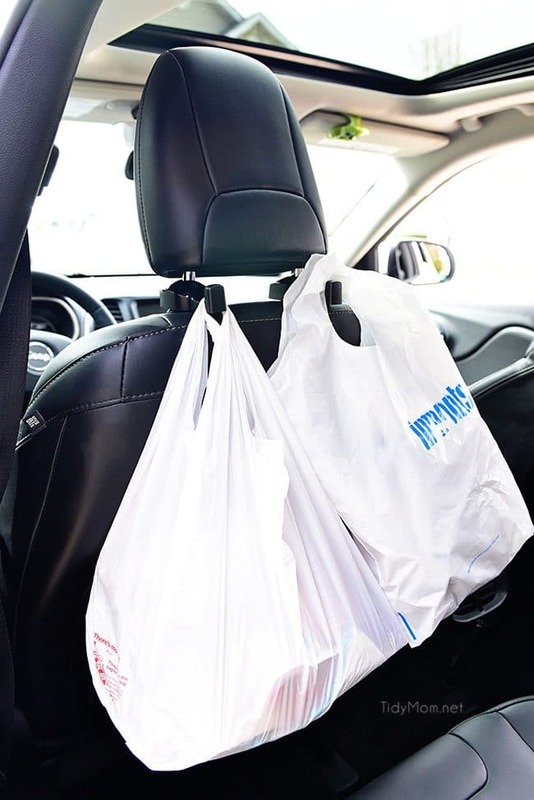 Not only does it keep your groceries or other items contained (think watermelon or bottles of soda), you no longer need to worry about items rolling or bags spilling in your car. It’s really great for trips to the big wholesale clubs, like Costco. It stays put because there is Velcro on the bottom. Best of all, it folds up when it’s not in use, and takes up almost no room at all. I also plan to use it to place items that I purge from the house to donate. There’s a Goodwill on my way to the grocery store, so I can stop an drop-off my donations and empty the trunk organizer before shopping. Two of the compartments are insulated for transporting cold and frozen items home from the store. 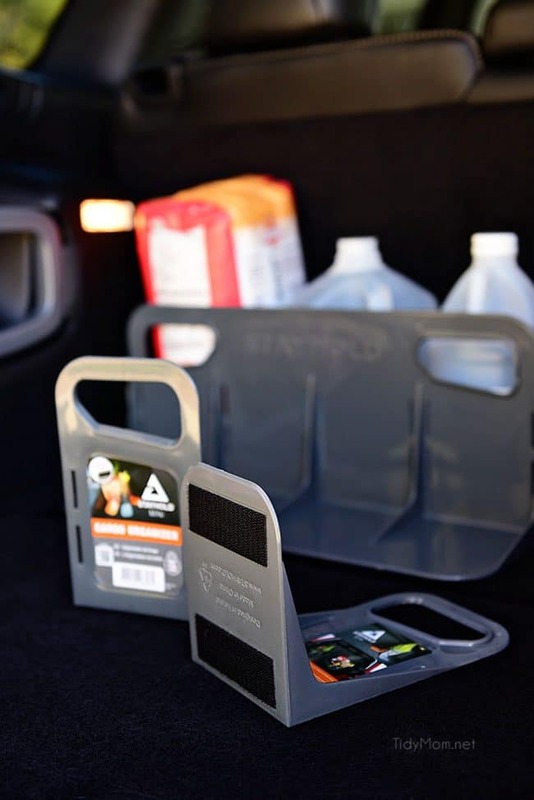 These cargo organizers let you adapt to whatever you need transport. Useful for shopping bags, holding suitcases, stopping bottles, plants, gallons of milk etc from rolling around and countless other uses. The Stayholds grip the carpet in your car to prevent it from moving when an object pushes against it. Trust me, they are super strong, but very easy to move and reposition by grabbing the handle. So handy when hauling something like plants, or our propane tank to refill for our grill. Or position them to hold things that stay in your car, like sports equipment. 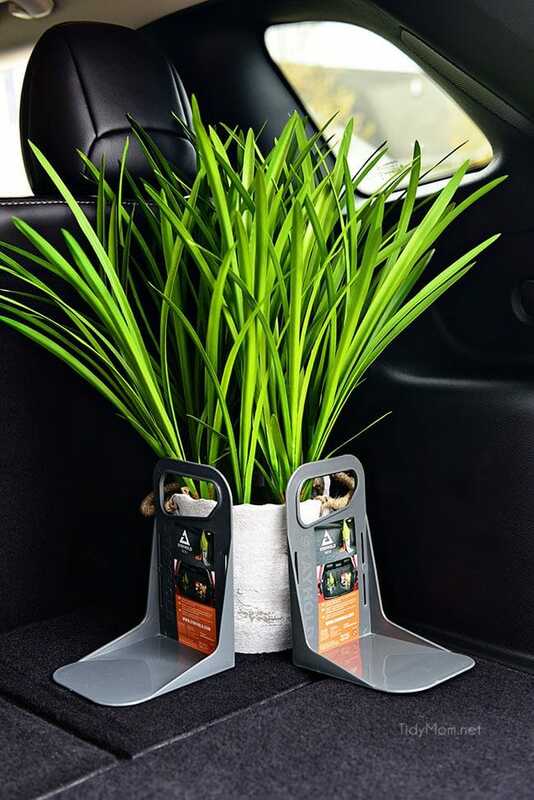 These nifty headrest hooks convert your car’s headrest into a convenient storage space to hang shopping bags, purses, water bottles, kid’s toys, baby supplies, trash and much more! When there’s someone in the passenger’s seat, I have nowhere to go with my purse. If I put it on the floor in the back, I can’t reach it without getting out of the car. I found these universal hooks that just clip onto the post of a headrest. Now I don’t have to worry about my purse spilling over on the floor in the back and I can easily reach it from my seat. 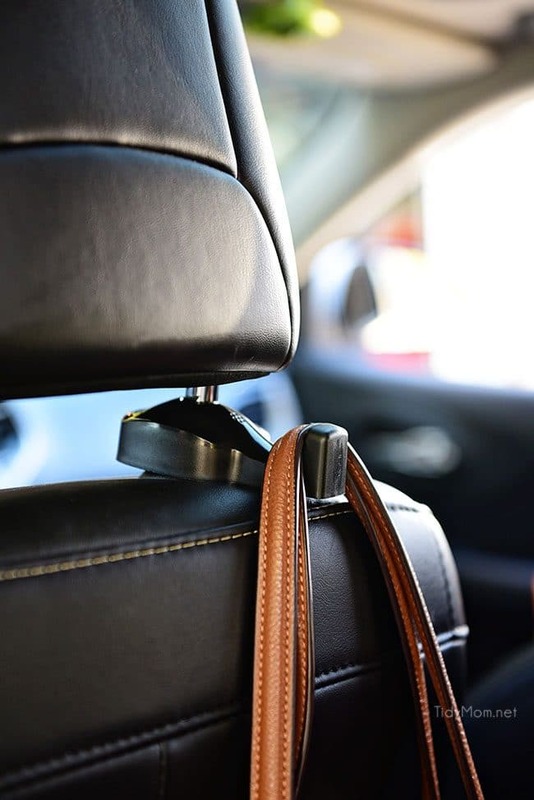 Headrest hooks are great for holding all sorts of bags, and on long trips, I keep an empty bag for trash. TIP: When you stop for gas, empty the designated trash bag in your car. Get the trash out of your car. Likewise, when you get home, be sure to take in anything that doesn’t stay in the car. 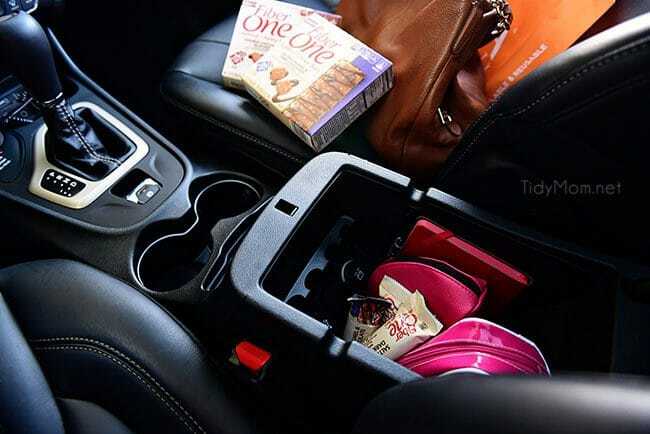 The center console can be a clutter magnet. Keep necessities contained by using small make-up bags (I use the free ones I get with make-up samples) for things like hand sanitizer, tissues, mints, lip balm, band-aids, tampons, travel size; hand lotion, hair spray, deodorant and the like. I also keep a notepad, pen, and snacks. 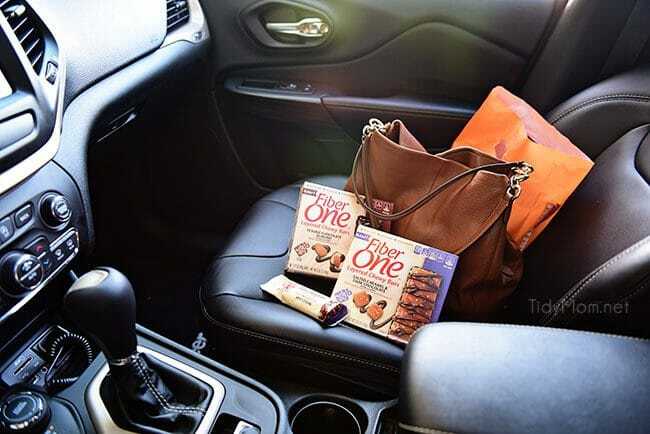 Have you seen NEW Fiber One Layered Chewy Bars? I had actually picked up a box before Fiber One reached out to me. I like the added benefit the fiber provides and the indulgent flavors without the guilt. The first time my teeth bit into the salted-sweet caramel and ended in dark chocolate with just the right amount of crispy and chewy it just felt. SO. INDULGENT. I can straight up tell you that the salted caramel, dark chocolate loving person that I know you are is going to fall head over heels for these Fiber One Chewy Layer Bars and their ability to benefit your overall digestive health with 7 grams of good-for-you fiber inside and only 150 calories (per bar). They also come in Double Chocolate Almond at 140 calories, both proved 28% of daily fiber value. I have been through 3 boxes in the last month. They make a great mid-day snack, and I love to toss a few in my purse and in my car when I run out for the day. 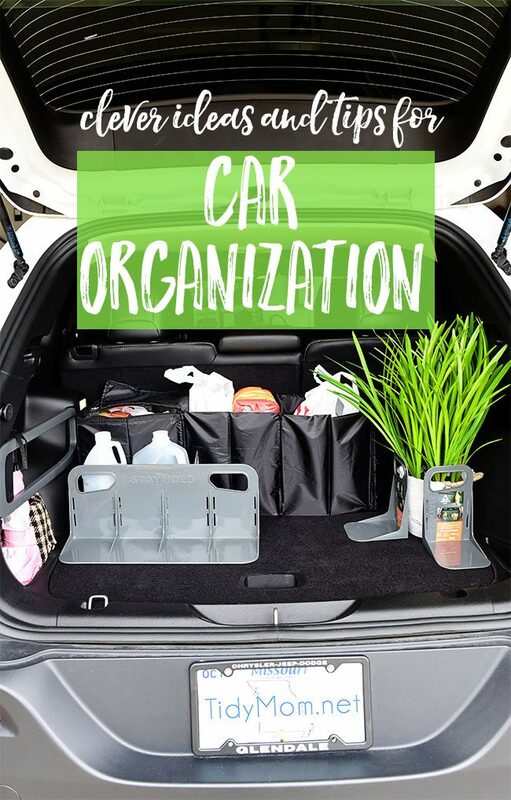 Like These Car Organization Tips? Pin It! Disclosure: I have a working relationship with Fiber One, but as always, all views, opinions……and my love of Fiber One Chewy Layer Bars are all my own. Thank you for supporting the brands that support TidyMom. You have the best ideas! My vehicle is a mess- living on a ranch creates a whole new world of things that get stashed in our vehicle! Those compartments and the Stayholds are genius. I will have to pick up some Fiber One Bars to help me power through to get that mess organized and cleaned up! Great products! I can’t tell you how many times I could have used these over the years 🙂 Great post! I love all of these tips, Cheryl! Especially the headrest hooks! 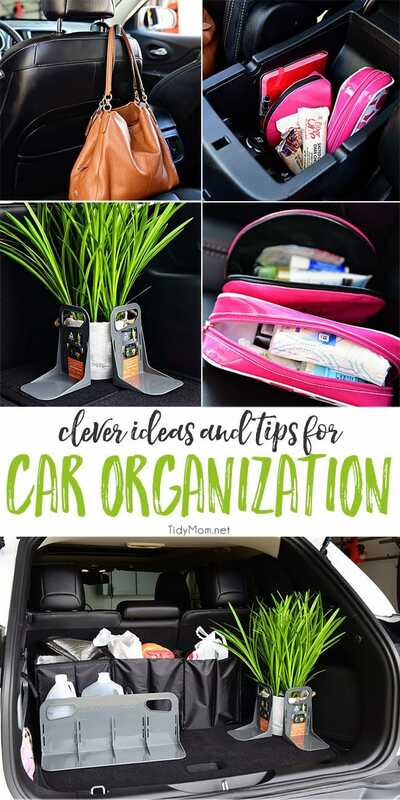 I love having an organized car, and all of your great ideas will really help! Thanks! 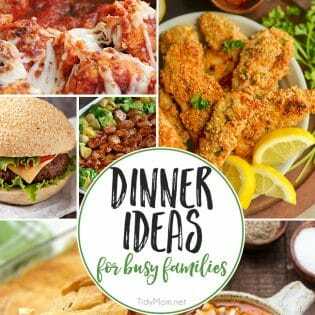 I totally need these tips! My car is a hot mess ? Pinned! I desperately need to utilize these ideas in my car and can’t wait to try these bars…I love them for breakfast. This is really interesting also helpful. I never thought about it before. 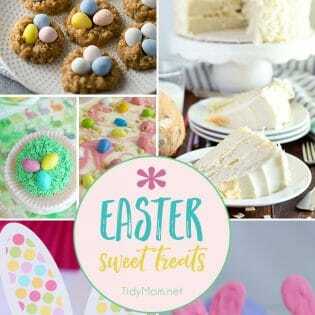 I just love your all tips these are you posted on your article. I can’t wait to having an organized car, and all of your great ideas will really help. Thanks for the sharing such a useful article with all of us.